Neil Young's retro-fitted vintage lincoln: The race is on. If the Big three cannot agree to make only cars that are fuel efficient enough to get at least 50 MPG by 2011, 75 MPG by 2013 and 100 MPG by 2015, then they should go into bankruptcy and fend for themselves like all the other businesses that are having trouble. A Perfect storm for innovation is gathering in Washington. With the government’s recent financial assistance to GM and Chrysler, the Big 3 now have until the end of March to make the case that shows how they will survive. Survival is not enough though. America now has a chance to lead the world in power and fuel efficiency. The Big three will still be looking for help at the end of March. As the major shareholder, the US government would have an opportunity to DEMAND the type of cars that will lead the world toward saving the planet for future generations. If the Big three cannot agree to make only cars that are fuel efficient enough to get at least 50 MPG by 2011, 75 MPG by 2013 and 100 MPG by 2015, then they should go into bankruptcy and fend for themselves like all the other businesses that are having trouble. The truth is this can be done and innovators know the way to do it. Better Place is a new model for power distribution to replace the old model of gas stations that supported the evolution of the automobile to this point. Better Place is taking hold in countries around the world and in some areas of the US. Better Place’s revolutionary concept for distribution of power to vehicles actually lowers the price of the vehicle by making the battery free to the consumer and automaker, while a subscription allows the user to only pay for miles traveled. There is a great opportunity for innovative solutions with Better Place. The Automotive X Prize is a race of 100MPG vehicles across America in 2010 sponsored by the Progressive Insurance Company. There are many entries. These cars must be safe and have a business plan that allows for at least 10,000 units per year. Automotive X prize contenders need to share their knowledge with the Car Czar. How will they get their cars to the magic 100mpg? There are some good ways to do it. Now is the time to share. Innovators should swarm like locusts on Washington in January, February and March to show the Car Czar how to make fuel-efficient cars. A Car Czar who knows how it can be done, and a government in control of the automakers while they stabilize will be key to demanding all autos made in the USA have a minimum mileage rating of 50MPG. This includes cars, SUVs and pick-up trucks. Now it is time for America to take back the reins of innovation and show the true wave of the future. It is a window for a sea change and a new opportunity for America to lead the world. Lincvolt, an X Prize contestant, is a 2.5 ton, 19.5 foot American classic now attaining 65 MPG utilizing electricity and domestic fuel. 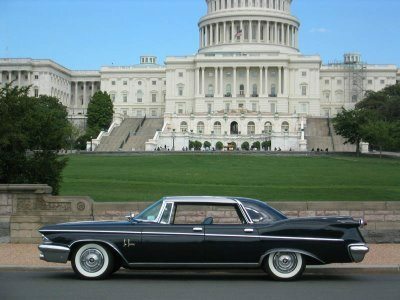 The converted 1959 Lincoln Continental MK IV demonstrates that today’s big sedans SUVs and pick-up trucks can get at least 50 MPG if they are fuel-efficient and use electric power, making it obvious that smaller cars could do even better than that. Ultimately, the Lincvolt team aims to demonstrate a Lincvolt hydro bio-electric series hybrid that will attain 100MPG with domestic fuels and very low emissions. In February, Lincvolt will begin an historic drive to Washington to showcase “the people’s fuel,” and show the President, the Car Czar, Congress and the Senate how innovation happening right now in America can be a beacon of change to the world. The Lincvolt team invites the other contestants in the Automotive X Prize Race, Better Place, and innovators from around the world to join us in Washington during the first 100 days of the new administration. Wow, look at that car…. and it’s already been built! I’ve been telling Frank that the technology is out there, that it has been out there. Just because the Big 3 have their heads up the collective fannies of Big Oil doesn’t mean these issues haven’t been on the minds of innovative people from all over. I’m glad I kept my old Chevy, I’ll go hybrid! Excuse me, but am I the only one who noticed that the car pictured at the top, described as “Neil Young’s retro-fitted vintage Lincoln” is a 1957 Chrysler Imperial?